X-ray diffraction laminography (XDL) has been applied to silicon (Si) wafer samples with considerable lateral extension like typical industrial wafers. 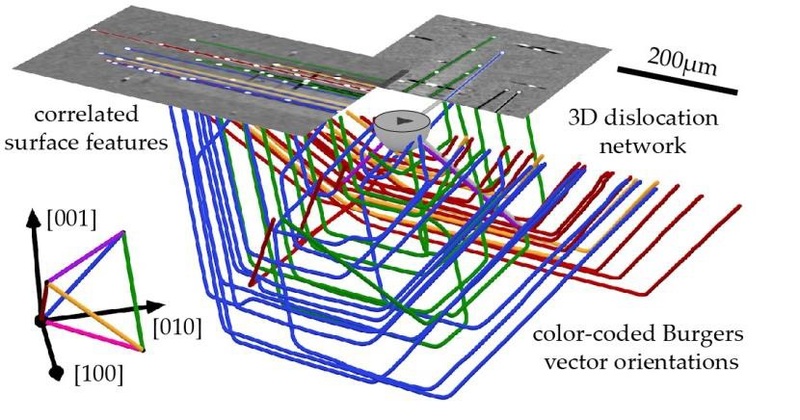 By combining XDL with X-ray white-beam topography (XWBT) and (circularly polarized) visible light differential interference contrast (CDIC) microscopy a comprehensive characterization of complex 3D dislocation structures was obtained, see Fig. 1 [Hänschke 2017, 2018, Horton 2017, Redmond 2018]. The 3D paths of the individual dislocations could be resolved with a resolution of about 3 micrometer, the associated Burgers vector distribution could be determined, and the bulk features could be linked to corresponding surface features like surface steps or mechanical damage. Fig. 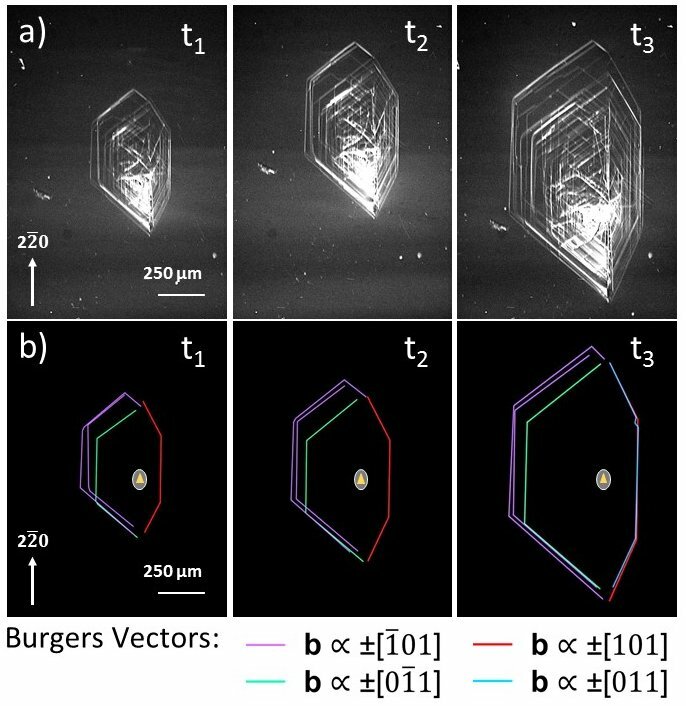 1: Comprehensive characterization of a dislocation pattern in silicon linking the (mesoscopic) 3D dislocation structure to the (microscopic/atomistic) Burger's Vector (BV) distribution - here color-coded - as well as to surface features [Hänschke 2017]. The nucleation, propagation, and interaction of dislocations within complex arrangements in silicon were observed by performing a gradual annealing alternating with 3D XDL scans. A double ellipsoidal mirror oven has been used for heating industrial Si wafer samples with prior mechanical nano-indentations above the brittle-to-ductile transition temperature (for Si 600°- 700°C) with suitable temperature gradients. During these thermal treatment, dislocations emerge from the mechanical damage and expand into the crystal volume. Fig. 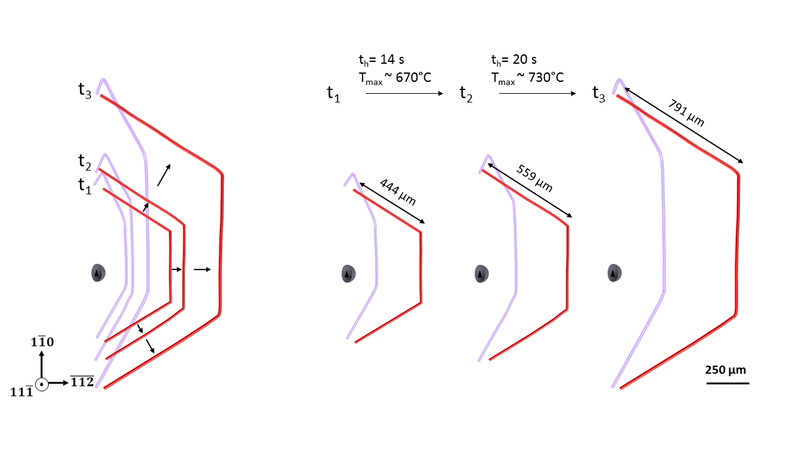 2 shows XDL projections for similar view angles illustrating the evolution between two annealing steps (t1<t2<t3). Based on these XDL data, the 3D volume was reconstructed and quantitative information has been extracted about the dislocation dynamics due to the thermally driven forces. For example, Fig. 3 shows the determined development of one selegted indivudial dislocation half loop. Within the STROBOS-CODE project, the tools for such the data analysis of quasi in situ 4D data will be further refined and the relation between the observed dislocation dynamics and the driving mechanical and the thermal stresses will be investigated in depth. Fig. 3: View on the evolution of two segmented dislocations from different slip planes and the length of the segments analyzed in 3D after gradual annealing. The project partners successfully applied XDL to the higher-Z semiconductor materials GaAs and CdTe to characterize different types of crystalline defects. The strain fields around two indents on a GaAs wafer are clearly visible in the weak beam XDL projection displayed in the left image of Fig. 4. These indents are imbedded in a network of dislocations, forming cellular structures of strain fields. In the center of Fig. 4 such cellular dislocation networks are shown in a 3D rendered XDL reconstruction. During the algebraic reconstruction process the so called weak beam contrast has been inverted. Unlike the two other images the contrast mechanism in the left image of Fig. 4 is the so-called integrated intensity contrast. With this kind of diffraction contrast it was possible to reveal small angle grain boundaries within the bulk of a CdTe wafer. The work on the field of high-Z semiconductors will be continued. Fig. 4: Left: XDL projection of dislocation networks in the bulk of indented (marked red) GaAs. Center: Image of a 3D reconstruction volume rendering of a cellular dislocation network in a GaAs wafer (defects are dark). Right: Integrated intensity image showing small angle grain boundaries within a CdTe wafer. We aim for routine application of the quasi 4D Imaging scheme (gradual annealing with intermediate XDL-scans) to Si and other crystalline materials of scientific and industrial relevance.